For those who have watched the television series “Vikings”, you will recall there is an ambitious and malicious character named Cwenthryth of Mercia. There is a scene on the show where Cwenthryth serves her brother poison in front of an entire dinner party. This scene reminded me of another eighth century Anglo-Saxon queen named Eadburh who was accused of poisoning her own husband by accident while trying to kill her husband’s favorite. Needless to say, I was intrigued. Was Cwenthryth a real person and did she kill her relative? I discovered there really was a royal princess named Cwenthryth in the ninth century. The origins of her story begin during the reign of the powerful and ruthless King Offa of Mercia. Offa went to great pains to ensure that his son by his wife Cynethryth named Ecgfrith would inherit his throne upon his death. Offa even had him crowned and anointed while he was still living, an unusual practice in England although it was a tradition on the Continent. Offa also ensured there were no close relatives to fight for the throne and take it from his son by killing them off. When Offa died in 796, Ecgfrith only reigned for a few weeks before dying, presumably in battle. 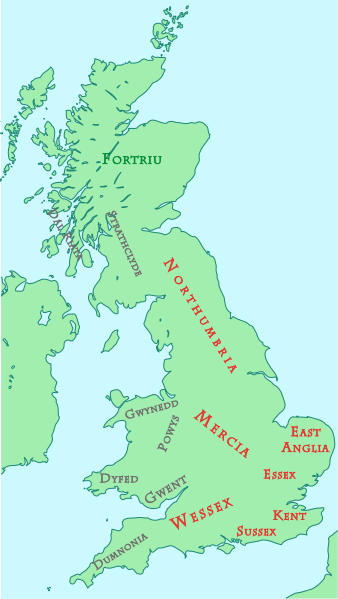 Due to the lack of close relatives, a distant cousin, Cenwulf, was elected King of Mercia. Cwenthryth was the daughter of Cenwulf. He also had a son named Cynehelm. A letter dated 798, allegedly from Pope Leo III is addressed to “King Kenelm” giving his age as twelve. Cenwulf may have had him crowned early just as Offa had Ecgfrith crowned. In 799, Cynehelm witnessed a deed giving land to Christ Church, Canterbury and from 803 to 811 Cynehelm’s name appears on several charters. After 811, he appears no more so he most likely died by then at age twenty-five. Cwenthryth’s name appears in one of her father’s diplomas or charters in 811, specifically designating her as his daughter. The Mercian royal house had connections with the religious house of Winchcombe. Cenwulf founded a monastery there in 798 and a new church was dedicated in 811. Cynehelm appears to have been buried there. Records indicate Cwenthryth possibly was established as the monastery’s abbess. During Cenwulf’s reign he acquired large tracts of land that included the Kentish religious houses of Minster in Thanet and Reculver. Cwenthryth inherited these from her father when he died in 821. Cenwulf had been in an acrimonious dispute over these houses and lands with Wulfred, Archbishop of Canterbury. There was an understanding that upon Cenwulf’s death, Wulfred would gain control over Minster in Thanet and Reculver. However, Cwenthryth repudiated Wulfred’s claim and refused to pay his rents and show obedience to him. Two councils met in 824 and 825 in Clovesho to consider the matter. Wulfred sued Cwenthryth in 825 in an effort to force her obedience and asking for considerable compensation for his alleged losses. Cwenthryth could no longer count on the support of the Mercian royal house but she managed to keep the litigation going until about 827. She eventually capitulated and retired to Winchcombe. There is no more record of her after this. By the eleventh century, Cwenthryth’s reputation was destroyed. A sophisticated passio (account of martyrdom) for Cynehelm had been written based on English songs and writings sometime between 1045 and 1075 by a monk of Worcester named Wilfin. The original manuscript is lost but it was copied by the monks of Winchcombe in the twelfth century. The story goes that when Cenwulf died, Cynehelm succeeded him as king at the age of seven. His sister Cwenthryth conspired with her lover Aescberht, who was also Cynehelm’s tutor, to have him killed. On July 17, the child was hunting in the woods and Aescberht took him to the hills of Clent in Worcestershire, beheaded him and buried him under a tree. Cwenthryth was now queen. But a dove amazingly managed to deliver a letter written in English to Pope Leo III in Rome relaying that Cynehelm had been killed and buried under a thorn tree in Clent. After having the letter translated, Leo informed Wulfred, Archbishop of Canterbury and other English bishops of the death, ordering that Cynehelm’s body be recovered and enshrined. The body was found and taken by procession to Winchcombe to be buried in the family mausoleum. As the body approached Winchcombe, bells rang out without the hand of man. Cwenthryth was in a window of the church in a chamber on an upper level. She asked why the bells were ringing. When told it was the body of her brother approaching the church, she began reading her psalter backwards in a kind of curse. She said if it was true the corpse was that of her brother, may her eyes fall out of her head. Her eyes promptly fell onto the psalter. The blood-stained book would later be displayed at Winchcombe. Cynehelm’s remains were buried in Winchcombe with all honors. Cwenthryth and her lover came to a bad end shortly thereafter and their bodies were thrown in a ditch. Cynehelm’s reputation as a saint was fully established by the eleventh century but Cwenthryth’s character was completely ruined by this fictitious story. Her fight with the Archbishop of Canterbury may have had something to do with this. Indeed, it is hard to know if the characters in the story actually relate to the children of Cenwulf or not. The legend was perpetuated by later chroniclers such as William of Malmesbury and John of Worcester. The story was so familiar to the people of England that Cynehelm is referenced in Chaucer’s “Canterbury Tales”. So there you have it. That is the true story of Cwenthryth of Mercia. The character in “Vikings” is a combination of the real daughter of a king, the vicious sister of a saint’s account of martyrdom and the legend of Queen Eadburh who allegedly poisoned her husband. Susan, I am reading Eadfrith, Scribe of Lindisfarne by Michelle Treeve. She mentions an Ecgfrith King of Bernicia who visits Cuthbert and makes him Bishop of Lindisfarne. He then goes north and dies with most of his men in battle against the Picts. But this one dies around 685 AD, so it must be another king. It is an interesting book. The Gospels of Lindisfarne are in my “bucket list”. Oh. this is fascinating, Susan! I had never heard of Cwenthryth. What a fabulous story. A fairy tale crossed with Game of Thrones. I think Cwenthryth deserves for the truth to be told, if it’s out there! Yes me too. Wish we knew more about her.